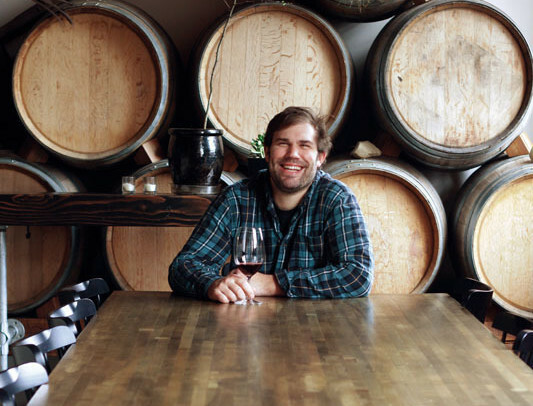 Fausse Piste winemaker Jesse Skiles shares the stories behind his pours. As a new vintage of urban wineries crops up in Portland, Sauvage at Fausse Piste has captured the zeitgeist with a distinctive flair. The candlelit, barrel-lined Central Eastside space showcases the devil-may-care approach of urban vintners, serving sophisticated small plates while shining a spotlight on the winery’s Rhône-inspired cuvées. Most employees work the dinner line as well as the barrel room. Despite the growing number of restaurants nationwide that stock Skiles’s wines, Fausse Piste bottles won’t carry a Robert Parker score any time soon. A favorable ranking from the Wine Advocate’s influential writer can make a wine overnight, but Parker favors big, oaky, high-alcohol flavors. “They lose the whole point of what we do,” says Skiles. “Our wines aren’t meant to age. They’re not flashy—but they’re thoughtful and personal.” In that spirit, Skiles shares the stories behind the Fausse Piste wines available this month at Sauvage.